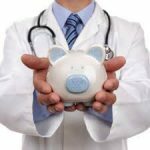 While there are many reasons healthcare is so costly, a doctor shortage may be one of them! In Netherlands, 14.6 of every 100,000 persons become a doctor. In Britain, the ratio is 12.8, in Germany it’s 11.3, and in France it’s 9. Here it’s 7.5! And, the percentage of Americans going to college is generally higher than in most European nations. Median medical school debt of $195,000 may be why.